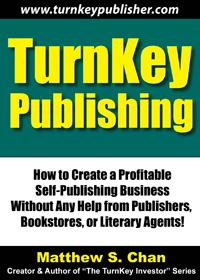 I have been mentally drained for the last 2 weeks not updating my blog because nearly all of my writing energies have been directed to the launch of my newest publishing project, “TurnKey Publishing” and its companion website TurnKeyPublisher.com. I have been logging some incredible late night hours writing and constructing my newest book. Every time I think I am close to completing my first draft, I think of some topics to add to the book. Some topics I wrote had to be removed and sidelined because it belonged into another book and not directly relevant to the immediate one. And so, the past 2 weekends I was thinking I was close to finishing but now after yet another feeling the need to do more research to add more topics, I am now trying to finish a first draft 2 weekends from now. If I have to go into March 2008 to finish my first draft, I think I might choke. This is probably the single most important publishing project in 4 years since I launched the “TurnKey Investing” series in 2004. I have learned a lot of lessons of launching a new book series and so I am trying to streamline everything. More importantly, I want to add at least 4 TurnKey Publisher titles after the foundation book has been released. Basically, I am trying to accomplish within one what it took me over 2 years to do with the “TurnKey Investing” series. I guess I just believe in taking things slow. Truly, there has been a lot of news and issues to comment on and I eventually want to. But this blog has to take a backseat until I complete some major milestones.